Gabe Newell brings in economics professor to fix his virtual worlds. Most of you would probably be over the moon if Valve offered you a job, but when Greek economist Yanis Varoufakis got an email from Gabe Newell offering him a position, he nearly deleted it. 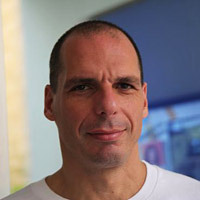 Varoufakis is glad he didn't, and now is Valve's economist-in-residence, advising on designing virtual economies for Valve's free-to-play games. Varoufakis is no gamer, and when the email arrived he had no idea who Newell was or what possible interest this strange American might have in Varoufakis' work. To the professor, Newell was just another crackpot in a long line of loonies, and he had cause to recognize the type. His email inbox had been full to overflowing ever since he became a talking head for the news networks, an expert whose nationality and specialization made him the perfect go-to for anything to do with Greece's economic woes. Most of the flood of emails he subsequently received had been 'investment opportunities' of the dodgiest sort, so there was little reason to think that Newell's offer was any different. "We are running into a bunch of problems as we scale up our virtual economies, and as we link economies together," read Newell's email, "would you be interested in consulting with us?" It was the virtual economies bit that kept Varoufakis interested in Newell's proposal, and so he went to Seattle to see what was actually proposed. Turns out, the offer was Varoufakis' dream come true: a chance to study an economy where every single transaction left a measurable data trail. Newell had been watching the news like everyone else, and had seen parallels between his attempts to create a workable in-game currency system for his free-to-play worlds and the quagmire that Germany and Greece are struggling in. Newell decided to get his information from the source, and so an unlikely partnership was forged. With luck, and a lot of data mining, Varoufakis will help Valve's virtual worlds develop working economies - as he puts it, helping serve them as "gamers but also as traders, developers, participants in something much bigger than just video games." His enthusiasm is palpable, and it's a subject that will become all the more important for gaming as crafting and real-world money becomes integral to the virtual realm. This should be an interesting experiment to watch.